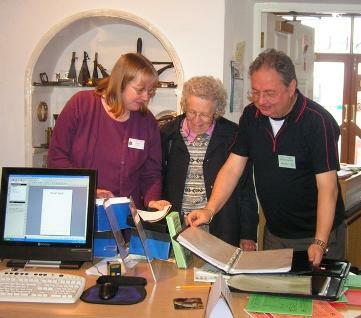 Holsworthy Museum has numerous resources to aid visitors in search of ancestors, or researching aspects of local history. As a designated Service Point for Devon Heritage Centre the Museum also holds microfiche copies of Parish Records (Baptism, Marriage and Burial) for Holsworthy and the surrounding area, including a number of Cornish parishes. Access to the museum archives and Service Point is by appointment and is available during the museum's normal opening hours only. To avoid disappointment, please ensure you contact us prior to your visit. The Service Point and other research facilities provided by the museum are intended for use by people visiting the museum to carry out their own research and are free of charge for those who do so. The museum is managed and run entirely by volunteers and consequently we are unable to carry out detailed, long-term research on behalf of those unable to visit the museum in person. Family history enquiries made by post, email or telephone will be dealt with by our Family Historian who is able to provide a maximum of three hours research per enquiry, for which we request a minimum donation of £25. Although no charge is made for access to the archives we would be grateful for any donation to the museum to enable us to continue the service.